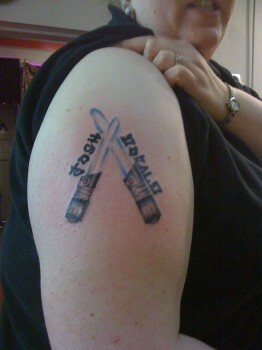 Exhibit A: Photo of Jessie's tattoo. 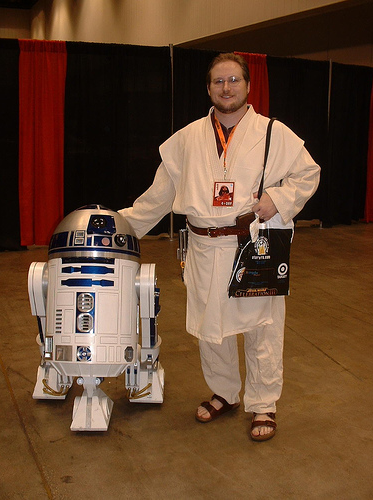 Exhibit B: A photo of Donald "in costume at the last Star Wars convention I attended, several years ago. My updated costume is not quite ready for photos so I thought this would be a suitable replacement." Exhibit C: Donald hopes to complete a costume worthy of acceptance into the Rebel Legion. I saw a friend post photo of Star Wars Celebration 6. Did Donald receive acceptance into the Rebel Legion? Did Jessie enjoy her vacation? Excellent show! You, with the help of the entire Maximum Fun Network, helped me survive the 12hr drive from Madison to Pittsburgh and back again. Thank you so much! my favorite show in a while! my favorite show in a while! i loved hearing little Josh Skywalker on the show too. made me think of my 6 yr-old who has just passed through a months-long Star Wars obsession. now he's obsessed with the Hobbit/LOTR, which I've loved ever since I was a kid. with Halloween coming up, this episode gives me important food (pellets) for thought in broaching the subject whether my wife wants to participate in LOTR costuming. she would make a beautiful African lady Arwen... thanks Judge! I really do. It's my favorite. but Judge, please can we get an injunction on men wearing sandals when not within 20 feet of a pool or any larger body of water? This would all be settled if they'd both join Team Banzai. So, when do we get to see the video of that lightsaber fight? To borrow a Savage Love term, Jessie is the GGG partner of this nerd marriage, Donald is just a handful of gimme. I don't want to be drastic, but Dan would probably advise, "DTMFA"
Another great show, and total nerdfest. I loved it! I was laughing out loud in my car. I loved the suggestion that she dress as Wonder Woman at the Star Wars convention. Happily, our plans to dress up with our kids this year as Adventure Time are still in place. Here I come, Princess Bubblegum!